I just finished my half of the thank-you cards. I refused to let myself check my e-mail until the task was done. 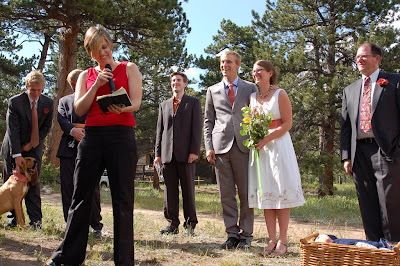 We got married on July 19, 2008. Today is September 8. Ugh. We are almost at the two-month mark. Pathetic! 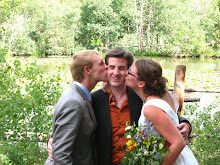 It occurred to me that we should've personally called everyone after the wedding to thank them for coming. Of course this act wouldn't replace tangible thank-you cards, but it would've been a really nice touch. One more wish-I-would-have: Addressed the thank-you cards before the wedding. And even stamp them. It's a small detail, but buying stamps and addressing cards can be major hurdles. Once I actually forced myself to sit down and write them, it was a wonderful experience. 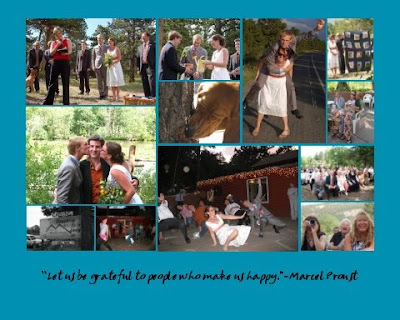 We sent thank-you cards to everyone who attended the wedding, not just people who gave us tangible gifts. We wanted to appreciate everyone's presence at our wedding. I also cried as I wrote some of them. I was so touched by our friends' willingness to help out. There was Brent, the fajita-maker, who was the crux of our self-catered reception. We never could have done it without his eager contribution. Then there were Christy and Chris who picked up the cakes from Whole Foods and brought the frozen margarita machine to the reception. I wrote a card to Laura, one of the owners of Meeker Park Lodge (the ceremony site), and thanked her for letting us use her facility for free. Picnic tables right by a lake were perfect for us. 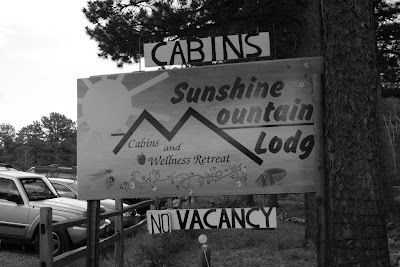 Then I had to thank Cathy and Cory, the owners of Sunshine Mountain Lodge. I explained to them that I have impossibly high standards (which border on neurotic). 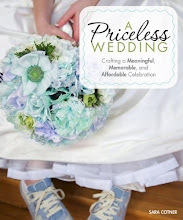 I got to thank them for ensuring that our wedding experience exceeded my expectations. They were so competent and welcoming and caring and generous. The front of the cards was a collage of pictures from the wedding. 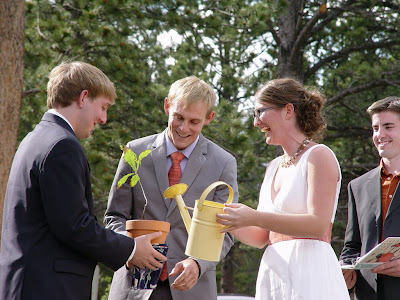 There was a picture of me laughing during the tree-planting ritual because I poured so much water into the pot it started to come out the bottom and soak my brother-in-law's hands. I said something like, "I just want to make sure it lives!" 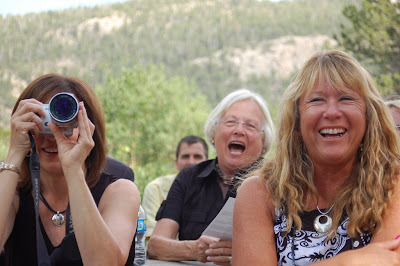 There was a picture of guests cracking up as they watched the wedding ceremony. Maybe it was during the tree-planting ceremony? Maybe it was because our dog, Hoss, threw up right when the ceremony started? 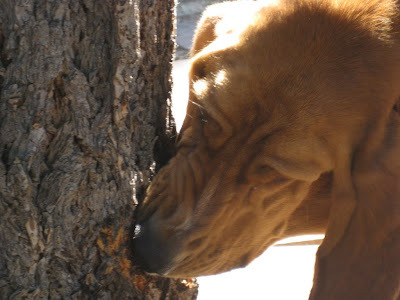 There was a picture of Hoss chewing on a tree, which perfectly captures his tendency to chew on anything that's random (which leads to the barfing). 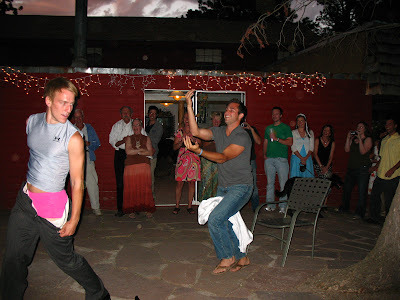 There was my other brother-in-law doing his quasi-striptease during our choreographed first dance. He was wearing pink spandex under his suit. There's a picture of our dear friend, Laura, reading an Alice Walker poem about how marriage is not the merging of two people into one but the strengthening of two distinct individuals. There's a shot from breakfast, when I'm just chilling on Matt's lap in my favorite pajama pants. When I look back at the pictures and write sincere thank-you notes to friends and family, I am overwhelmed by such appreciation for the wedding we were able to pull off. It was the perfect wedding for us. It prioritized community, connection, commitment, and fun. It showcased our values: hand-crafted, eco-friendly, and budget-minded. I wasn't stressed during the ceremony because I was excited to share it with our friends and family, and I was close to most of the people in the audience. The reception didn't fly by in a blur because I didn't have to do the "meet and greet" thing. 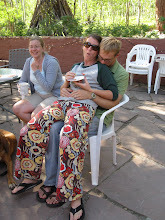 I had spent time with people at breakfast, made guacamole with them in the kitchen, hung out with them in the hot-tub at the Welcome Picnic the night before, rode on horses and hiked with them days before the wedding. I didn't have any stressful interactions with vendors because most of the vendors were our friends. It was the perfect wedding for us. Here's my wish for all of you who are planning a wedding: May you create the best possible wedding for you and your fiance. Figure out what you want. 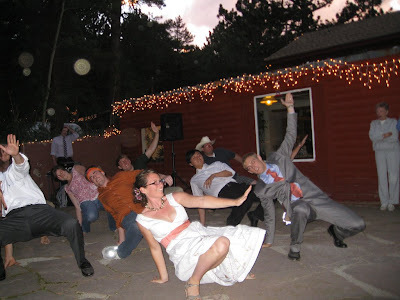 What you really, really want your wedding to be. And then make it happen, regardless of the influence that other people try to exert over you (why should their tastes and preferences matter more than your own?) and regardless of anyone's skepticism or judgment. After all, the Wedding Industrial Complex is right about one thing: it is your day. Now, I've got to go add personal messages to Matt's half of the cards!